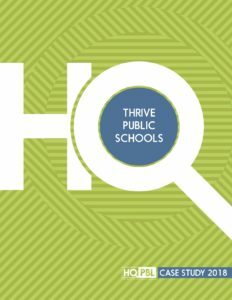 At Thrive Public Schools in San Diego, California—a school network with a strong focus on high quality Project Based Learning (HQPBL)—projects are a necessary part of reaching the diverse population served by the school. About half of Thrive students are eligible for free or reduced lunch; as many as one in four are identified as ‘exceptional learners’; and nearly 30% of students speak a language other than English at home. With students coming from 45 different zip codes—including families of Somali refugees as well as San Diego’s most affluent families—there are some who travel over an hour each way in order to study at Thrive. They make up a religiously, ethnically and neurologically diverse cohort. The Thrive community views this diversity as one of their greatest strengths. And supporting students as they learn to be, developing an understanding of themselves and others, with an emphasis on SEL, council, and self-acceptance. Assisi previously co-founded Da Vinci Schools, a successful charter school network in Los Angeles that continues to infuse its programming with PBL methodologies. She is confident that HQPBL student experiences are key in helping to eliminate the opportunity gap in K-12 education. Who is committed to HQPBL? Copyright © 2018 HQPBL.org. All rights reserved. Contact: hqpbl.org@gmail.com.